Just because temperatures are dropping and the trees are losing their leaves, it doesn’t mean our wardrobes need to reflect the same dreary transition. Sure, we’re naturally going to have to layer up a little bit more and start thinking about investing in chunky knits and textured tailoring, but fear not – we have the solution to preventing your look turning as grey as the wintry skies above. Primary colours were key at the AW14 shows, supporting our suggestion of using cheerful hues to liven up your look this winter. FashionBeans has already reported how striking orange, military green and masculine blue are set to become major colour trends, so make sure to catch up on those features if you haven’t read them already. If you like the idea of trying out brights in autumn/winter but want to ease your way into the look, test the water by adding one bold coloured piece to an otherwise dark ensemble. This will liven up your outfit subtly without you drawing too much attention to yourself. Or, for those of you employed in creative industries, why not team a chambray shirt and your trusty navy blazer with a pair of winter chinos in bright mustard for the office? If your workplace calls for a more formal approach to your weekday attire, you’ve still got room to inject some colour into your look – even if it’s reserved for your morning and evening commute. Remember, if bright and bold hues are too much for your personal style or the occasion, deeper, darker shades offer a ready-made alternative: switch amber for burnt orange, yellow for mustard, emerald for army green, red for burgundy, etc. For the more confident among us, take a braver approach to your wardrobe this winter through the art of colour-blocking. Often seen as a technique that is strictly reserved for summer, there’s nothing to say you can’t pair bright colours and pieces together during the colder months. The key here is fabric choice. For instance, try teaming a chunky oversized jumper in bolt blue with a pair of light tan trousers crafted from a heavyweight fabric such as cord, moleskin or wool. If pastels aren’t your thing and you’d rather tackle colour-blocking in a more pared-back way, match brighter shades with slightly darker colours. 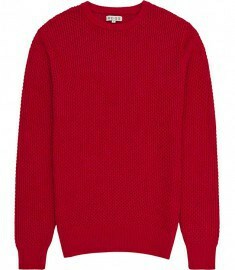 A crimson knit looks great teamed with trousers in a refreshing peppermint hue, while different tones of the same colour can also work well for more relaxed professional dress codes. Finally, a simple yet powerful way of injecting some fun and vibrancy into your autumn/winter wardrobe through the use of accessories. Whether in the form of sartorial essentials such as ties and pocket squares or casual weekend pieces like beanies, these finer details allow us to be playful with our look without it becoming too over the top. If you work in the corporate world and your colleagues don’t tend to turn up to work in an outfit made up of pastel-blocked shades, have no fear – the great thing about wearing a dark, monochrome suit (grey/black/charcoal) is that it acts as the perfect canvas for any colour you choose for your tie and pocket square. For a more winter-specific approach, utilise cold-weather accessories such as hats, scarves and gloves. These are the items that most men tend to lean towards when it comes to introducing colour to their autumn/winter looks and it’s clear to see why: there’s something distinctly high fashion and editorial-like about an oversized chunky scarf in a dazzling orange or electric blue. And that’s without even considering how comfy and practical they are. When it gets to the frostiest part of winter and you want to layer up in all of the above, our advice would be to opt for a hat, scarf and gloves in different hues or patterns. Not only will this be more interesting to look at, but colour-matching is never quite as stylish as people think – prime example: sports presenters who match their printed ties with pocket squares (something highlighted in our common men’s fashion mistakes article). No matter how you decide to brighten up your wardrobe this autumn/winter, just remember to keep both fabric and colour coordination in mind. That said, don’t be afraid to have some fun with it! 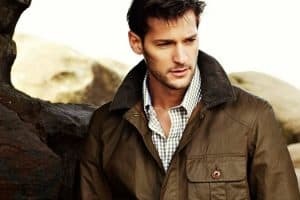 After all, there are plenty of things to feel miserable about during the cold and wetter months – don’t let your clothing and personal style be one of them. Now it’s over to you: will you be incorporating bright colours into your wardrobe this winter? And if so, how far are you planning to go with it?